After Jessica Farris gains entry into a high-paying ethics and morality survey (by not quite moral means) nothing about her life is ever the same again. “When Jessica Farris signs up for a psychology study conducted by the mysterious Dr. Shields, she thinks all she’ll have to do is answer a few questions, collect her money, and leave. Julia Whelan is one of my favorite audiobook narrators, making any book more interesting to me. Psychological thrillers have been really working for me recently. Perhaps the most buzzed about book this month. Narration: Since this is an audiobook review, it’s only fair to start here. 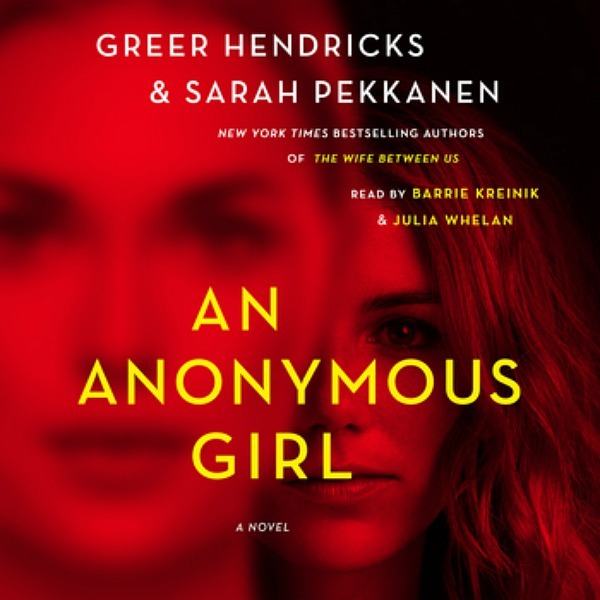 The chapters in An Anonymous Girl alternate narration between Jess Farris, read by Julia Whelan, and Dr. Lydia Shields, read by Barrie Kreinik. Both were excellent. Whelan especially brought Jess and her constantly shifting emotions to life. Jess’s chapters were told in first person, and Whelan completely became Jess for me. Dr. Shields, the more unreliable of these two central characters, told her story in a mix of second and first person. She was a creepy woman and Kreinik’s reading made sure we never forgot that. Her narration was smooth, always measured, always calm, just like you’d imagine Dr. Shields to be. Unreliability from Start to Finish – I appreciated that the writing team Hendricks and Pekkanen always kept me just a little off balance. Right from the start, you know something is “off” with this morality study Dr. Shields is conducting, but something is a little “off” with Jess, too. “Are you being Honest, Jess? You keep assuring me that Thomas has not responded to your invitation. My instinct was to peg, Dr. Shields as the villain, but I found myself constantly second-guessing that supposition. If the two women weren’t dizzying enough, the authors threw in a third character that was equally dubious. Thomas initially comes across as something of a knight in shining armor, that is until his past is revealed, and you realize he perhaps has even more to hide than either of the women. I loved the sense of disequilibrium created by this trio. The Ping Pong Effect – The layer upon layer of back and forth in this book made the story. The layout itself alternated narration between Jess and Dr. Shields, but there was so much more than that. Jess both worshipped and feared Dr. Shields, constantly second-guessing herself. Later in the book, she bounced between Dr. Shields and Thomas. Dr. Shields felt like the villain most of the time, but there was enough doubt to cause wonder and confusion. Thomas, too always seemed to be spinning, keeping the reader guessing on his true motivation. I’m left wondering if the fact that An Anonymous Girl was written by a team is what made the back and forth so impressive. If so, keep it up, Hendricks and Pekkanen! As I walk home now, I think of all the lies that link the three of us together. Because I know that Thomas is trying to deceive me, too…..
At least I’ve finally learned something concrete. Neither of them can be trusted. I have no idea why. But I can’t worry about that now. That Ending – I’ll give nothing away, but want to say that I am a big fan of the very, very end of this book. I’ve seen others question it, but I loved it. Bravo, Jess! Well “Dah” – I felt like An Anonymous Girl had a few places where things were just a little too obvious. For example, at the beginning Jess assumed the mystery doctor was a man, but anyone could reason that it might be a woman. So, why did that never even occur to Jess? Also, Dr. Shield’s motivation behind her study was quite obvious, as was a step she took later in the story. It’s nice to be right sometimes in a thriller, but I don’t like it as much when a smart character can’t see what’s going on. The HUGE amount of hype surrounding An Anonymous Girl made me nervous to read it, so instead I chose to listen. Sometimes this makes a big difference for me and I sensed this might be one of those cases. I think I was both right and wrong. From start fo finish I loved the performance of Whelan and Kreinik. They made the story for me, but I also think I’d have enjoyed reading An Anonymous Girl. Either way you choose go, I think you can’t lose with the latest from the team of Hendricks and Pekkanen. I loved the previous book by the authors, so I look forward to this one. The audio version is my preference so happy it was good. Since reading An Anonymous Girl, I’ve heard so many positive comments about the authors’ first book. I’ll need to go back and read it. Great review. I really enjoyed this one as well (although I did not listen to the audiobook). I’m looking forward to their third book! Do they already have a third book in the works? Narration truly can be everything! I liked their other book quite a bit better. To say why might be a spoiler for this book, so I won’t go further! Ah! I need to go back and read their first, especially if it’s better. Great review Susie! I read this (as an ARC) and I can see how the audio would also be great. I also loved both of the books you chose to recommend. All Is Not Forgotten is probably my favorite Wendy Walker book, although her latest is pretty terrific too. I enjoy books that feature a psychologist/psychiatrist! Have you already read the Wendy Walker book that’s coming out later this spring? I have that coming up. I really enjoyed the experience of reading this book, but your review makes me wish I went with the audio version. I also liked the ending. I think this was a book that would have worked equally well for me in print, and I don’t always think that after listening to a book. Sounds like a good thriller as an audio. I’ll look to get on the waiting list. thanks. Although I’ve read some of Pekkanen’s novels, I haven’t read anything by this duo yet, but this one sounds so good! I feel like there’s a high creep factor. I’ve only read one Pekkanen book, and didn’t care for it. It was way too chick lit for me. I think writing in this duo with Hendricks has upped her game.